Merchant & Gould congratulates Brian Batzli, partner and chairman emeritus, for his role with the American Intellectual Property Law Association (AIPLA), a national bar association that helps establish and maintain fair and effective laws and policies. Brian was re-elected for a one-year term as Treasurer of AIPLA. This is Brian’s third consecutive year in the role. He will also continue to serve on AIPLA’s Board of Directors where he helps further the organization’s mission as an innovator, powerful advocate, and visible global leader in intellectual property. The term started on Oct. 26, 2018. Founded in 1897, AIPLA is a national bar association constituted primarily of lawyers and patent agents in private and corporate practice, in government service, and in the academic community. AIPLA represents a wide and diverse spectrum of individuals from law firms, companies, and institutions involved directly or indirectly in the practice of patent, trademark, copyright, trade secret, and unfair competition law, as well as other fields of law affecting intellectual property. Its 13,000 members represent both owners and users of intellectual property, as well as governmental and non-governmental organizations. 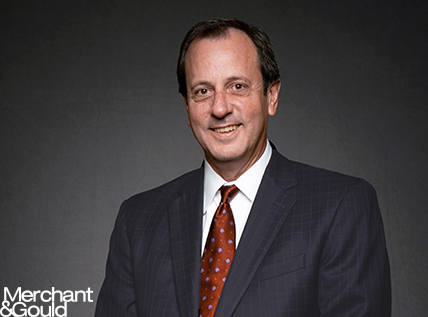 First hired as an associate in 1987, Batzli is now in his 31st year at Merchant & Gould. He was elected as the firm’s Managing Director, CEO and Chairman of the Board in 2010. He completed his term in those roles on June 30, 2018, when he welcomed his successor, Chris Leonard. Batzli now serves as Chairman Emeritus and has resumed his practice of strategic IP counseling, licensing, and patent prosecution in the electrical, mechanical and software arts.